We here at Kotaku have been having a lot of fun with rankings lately, from Halo to Grand Theft Auto to Final Fantasy to Pokémon. 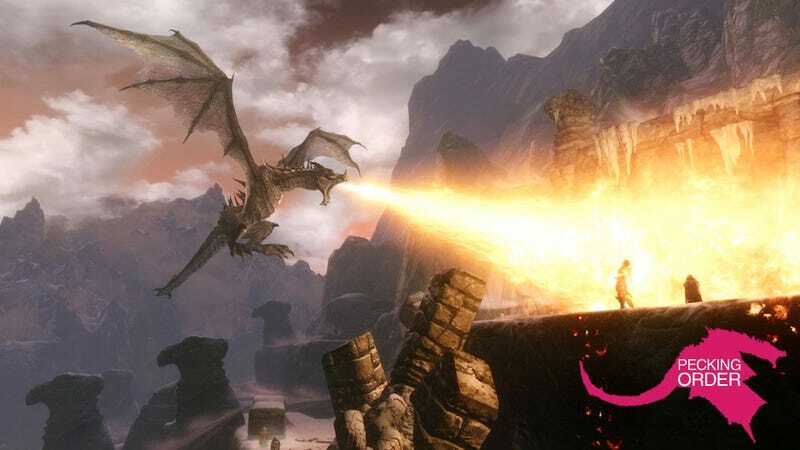 And now, it's time to rank the big daddy of single-player RPGs: the Elder Scrolls series. Of course, when I say "big daddy," I mean it: size is of the defining characteristic of Bethesda's Elder Scrolls games. But while all the games in the series might be big, are they all equally good? Let's find out. Before I start, a few notes: these aren't Kotaku's official picks, these are just my personal choices. I hope you'll offer your own list in the comments, and explain why you put them in that order. Also, I decided not to include expansion packs, even though The Shivering Isles is so much fun—I figured it would be better to include the expansion packs under the umbrella of their respective games. Lastly, I elected to keep this list constrained to numbered entries: so, no Battlespire, no Redguard, and no Elder Scrolls Travels games. Morrowind is arguably the series' most distinctive entry, and it's also my favorite. The bizarre plants and animals of Vvardenfell stick with me even today—the misty, sticky swamps, the remote desert cities, and the burnished metal of Vivec. While Oblivion and to a lesser extent Skyrim often felt like rote "fantasy" settings, Morrowind almost always felt like a whole new world. I have a feeling that Elder Scrolls games will continue to grow and improve, but I'm not sure I'll ever recapture the feeling of playing Morrowind for the first time. And the music… oh, man, the music. I don't have much more to say about Skyrim, considering that I've written approximately 5,000 articles about it in my time here at Kotaku. I'm not sure I've ever seen a game become an EVENT in quite the way Skyrim did—for months on end, it was so much fun simply to get caught up in the thrill of it all. Especially the dragons. It's a game I'm still playing, still modding; I'm still looking forward to the Dragonborn DLC, which has yet to come to PC. Every now and then, I have an insane desire to start up a new character and see if magic-using is really as weird as I've always found it to be. Skyrim didn't quite have the magic needed to usurp Morrowind as my favorite game in the series. But it came damned close. And hey, when all is said and done, it still might. I'll never forget when I picked up the first Elder Scrolls game, Arena. It was coming up on 20 years ago. I read the box in the Software, etc. in our mall and marveled at the thing—this was the most ambitious-looking game I'd ever seen. Could it possibly be as good as it looked? Turned out… well, sort of. It certainly hasn't aged all that well. But at the time, I remember being amazed that there were so many places and things in this world, and that they were all different. The fact that most of the game was copy/pasted doesn't take away from my many memories playing it, adventuring through identical dungeon after identical dungeon, figuring out ways to exploit the questionable-at-best combat system. I remember the first time I enchanted a weapon—I'd somehow managed to get an ebony katana (which was pretty badass on its own), and I went to the enchanter (I think?) in order to charge it with a spell. I had so little idea of how it would all work, and couldn't believe how complicated the whole system was. Would this really make my katana more powerful? Would it destroy it? What was going to happen?? I saved my money, then—and I vividly remember this—I woke up at 5AM before school began and went ahead and had the guy charge up my sword. And it worked! Something about that entire process just seemed so mysterious and real… it's the kind of thing that very few games manage even today, and it'll always be one of my formative gaming memories. Given how many hours I sank into Oblivion, it may seem surprising to see it so low on the list. But while Oblivion is an outstanding (even underrated!) game in many respects, its relatively dull setting of Cyrodiil and mostly boring, melodramatic story leave it somewhat below the other games for me. It may have polished the template set forth in Morrowind, but too much of the game felt like a soulless grind through a generic fantasy setting. I threw hundreds of hours into Oblivion, managed to level my main character until he could pick any lock, defeat any foe, and jump over most small hills. I sprinted into dozens of Oblivion gates, booking it past enemies and exploiting the glitch that let you quicksave, grab the Sigil Stone and warp out, then check the power granted by the stone and if need be, reload until you got something good. Man, did I have some mighty enchanted weapons in Oblivion. The Shivering Isles expansion went a long way towards addressing some of Oblivion's personality deficits, even if Sheogorath was insufferable most of the time. But as enjoyable as it all was, something about the game just felt hollow to me. I think it was partly that I played it on Xbox 360—this was when I'd traded my gaming PC for a mac, and was just getting back into gaming after taking a few years off. As a result, I wasn't able to mod the game to the extent that so many others could, and past a certain point, I simply stopped playing. Poor Daggerfall. If Elder Scrolls games are known for their size, Daggerfall is the Elder Scrolls game that suffered from being too big. "You like how big Arena was?" the folks at Bethesda seemed to ask, "Okay, check THIS out!" Daggerfall also has the unfortunate distinction of being the game on this list that I've played the least of, which I'm sure at least partly explains its last-place positioning. But it's also a chicken-and-egg situation; I think I never got all that interested in it because it was just too big (and spread too thin) to handle. You can download it for free and see for yourself—this game is almost comically oversized. I've heard from plenty of folks who found things to love about Daggerfall, so I'm not ready to call it a disaster or anything. But I'm happy that Bethesda decided to go another direction with Morrowind, to shrink their scope while adding detail. So there they are, my list of the Elder Scrolls games, from best to worst. What's your order?